If you’re looking to get away from the metro-sexual indie rockers, eastside stoner bands and tribute groups playing ‘80s covers in the valley, the most happening band in LA that you haven’t heard of is Vintage Trouble. Don’t miss your chance to catch them performing over the next couple of weeks. 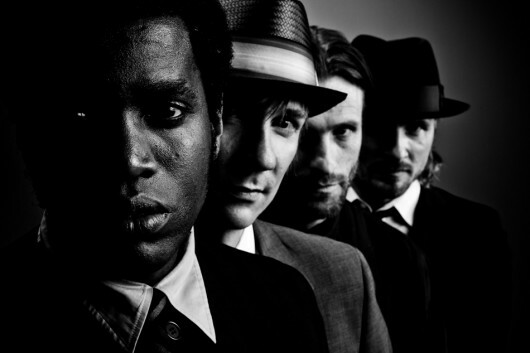 Formed in early 2010, Vintage Trouble describe themselves as “live-wired, dirty mouth’d, pelvis pushin’ juke music” and like Amy Winehouse and Raphael Saadiq, they take the classic soul sound and make it fresh and contemporary, adding a little bit of dirty rock and roll in the process. The band is made up of seasoned players however their greatest asset is lead-singer Ty Taylor. He manages to roughen up his velvety smooth soul tenor just enough to blend with guitarist Nalle Colt’s jagged, rhythm and blues riffing. The Trouble’s rhythm section consists of Rick Barrio Dill on bass and Richard Danielson on the drums. Onstage, the Trouble are indeed something to behold. Taylor, looking like he’s just stepped off an Atlantic Soul album sleeve from 1968, is capable of conjuring the funky get-down of James Brown, the rock bravado of Lenny Kravitz and the honey-tinged soul of Otis Redding. The band meanwhile, with their fedoras and mid 20th century suits, look like Chicago gangsters packing electric guitars instead of machine guns. In the dress down world of ironically cool Hollywood, Vintage Trouble give people an excuse to dress up while they get down. The audience at any given Vintage Trouble show is generally packed with the band’s fans, known coincidentally as “Troublemakers.” Whatever you want to call them, they’re usually worked up into a frenzy midway through the first number. The band has a full April schedule before heading across the pond for their UK tour, including shows at Harvelle’s in Santa Monica, The Edison downtown, The Tar Pit on La Brea and Barre Vermont. Any Vintage Trouble show is a guaranteed good time but if you can, catch them at Harvelle’s on a ‘Trouble Tuesday’ where you can experience what drummer Richard Danielson, describes as, “Vintage Trouble at their most juiced,” playing to their home crowd of Troublemakers. Alex is a freelance journalist and actor living in downtown LA. He also writes for 90Soccer.com and is a contributor to Resource Magazine in New York. When Alex isn't working, he enjoys travel, DJing, writing music and playing soccer badly. For professional inquiries or pick-up games, he can be reached at alexbakerblogger@gmail.com.